Medical or natural gout treatment is our next choice in a personal gout treatment plan. Many people make this choice too soon. First, you should follow all the preceding steps in Personal Gout Treatment Guidelines 2016. See Medical or Natural Gout Treatment summary. You need to be certain which aspect of gout you are treating. Gout pain control, uric acid control, or both. With that information, you can narrow down your treatment choices between pharmaceutical gout medications, natural gout remedies, or a mixture of both. There is a small range of gout treatments that do not involve pharmaceutical or herbal medicine. You might also consider these types of gout treatment in your plan. Your biggest influence on medical gout treatment is your doctor. It is important to build a good working relationship with your doctor. Often, people who feel unsure about daily gout medication from their doctor will try various herbal remedies. You need to be very careful how you make these choices. If you prefer natural gout medicine, then you should assess it clearly. If you are treating gout pain, it is easy to tell if your medicine is working or not. However, unless you have your blood tested, you cannot tell if natural uric acid lowering medicine is effective. That is why I insist on being clear about which aspect of gout treatment is most important to you. It is OK to mix different types of treatment. But, you must check relevant safety guidelines. Never exceed recommended doses of medical or natural gout treatment. Many people use medical gout treatment for gout pain. With natural gout treatment for lowering uric acid. As long as you are clear how you measure the results, there is no problem with combinations like this. 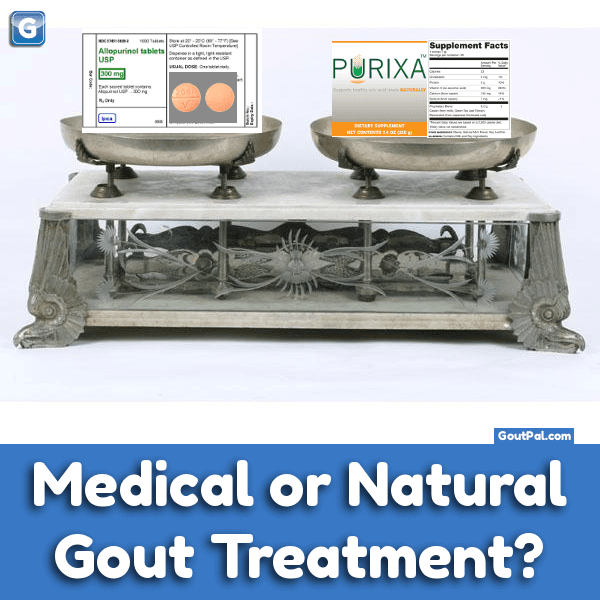 Medical or Natural Gout Treatment? Make choices that you can measure and control. You must be wary of misjudging uric acid lowering treatment. This can be a problem with both types of medicine. If you are lowering uric acid with medical or natural gout treatment, you should get your blood tested regularly. That means blood tests for uric acid, liver function, and kidney function. 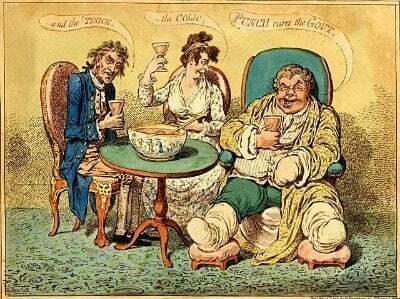 If you are not sure which type of gout treatment suits you best, consult a professional health adviser, or ask in my gout forum. When you make your choices, you should include reasons for those choices. If you have no preference between medical or natural gout treatment, you should say so. Leave Medical or Natural Gout Treatment to browse my Gout Treatment Guidelines. TL;DR - Medical or Natural Gout Treatment? If you need help with any of those, ask in GoutPal's Gout Forum.